This week it was announced that American artist and urban planner Theaster Gates is coming to Bristol in October to bring new life to the city’s Temple Church where musical performance will take place round the clock for 24 days following his successes with a series of buildings in Chicago which he has brought back into use and restored with recycled materials, Gates’s magic touch is being sought all over the world. I first heard him on the radio a year ago on Radio 4’s ‘Zeitgeisters’ and he certainly is that. I have been following him ever since and quoting him whenever I have the opportunity. Gates is an inspiration for all those working with historic buildings. He was trained as an urban planner and then took a Masters degree in ceramics and theology. A polymath, he creates work out of fragments of old buildings, and restores buildings using repurposed materials. He has a reverence for craftsmanship, both machine-made and handmade, that imbues his restoration projects. In this sense he is carrying on the traditions of Philip Webb and William Morris. 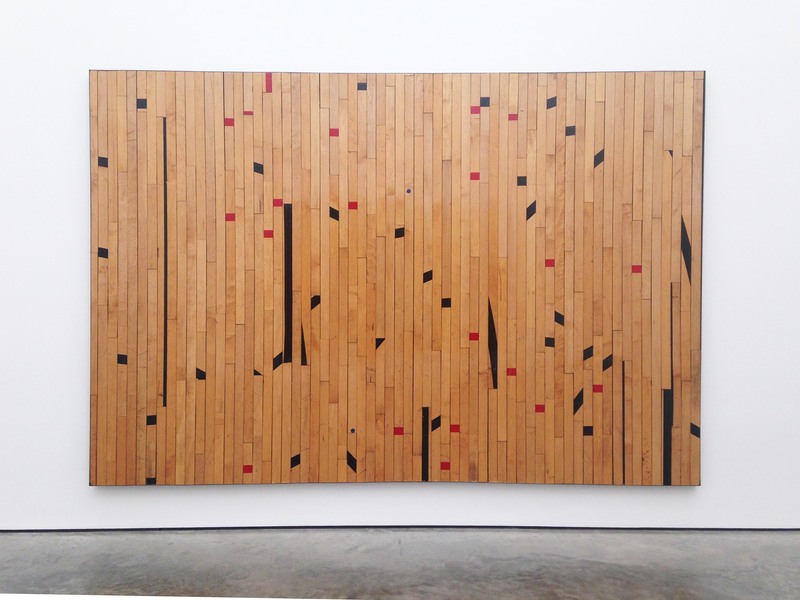 Gates’s father is a roofer and he has been using these methods to make art. 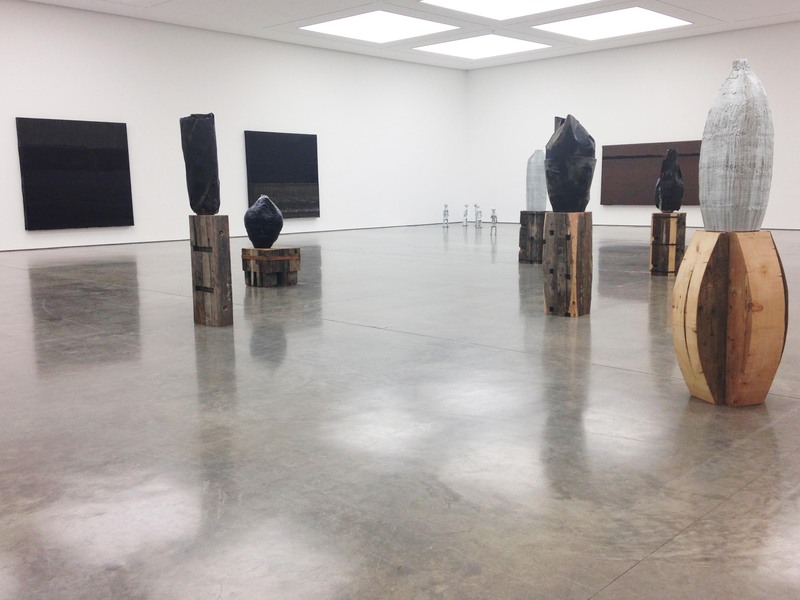 A room of tar paintings featured in a recent show at the White Cube Gallery, Bermondsey. In the spirit of Webb and Morris he says in a film accompanying the show: “I was seeing if there’s a way that through a formal engagement with roofing I might get to painting. 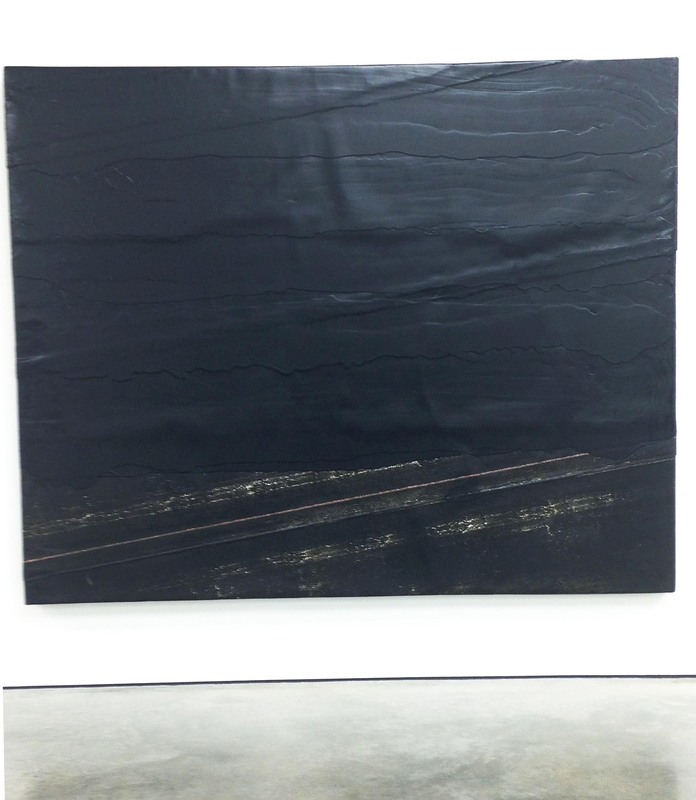 And even if I don’t I would actually get to the essence of roofing and maybe there’s something redeeming within that material set itself.” The tar paintings are extremely beautiful. 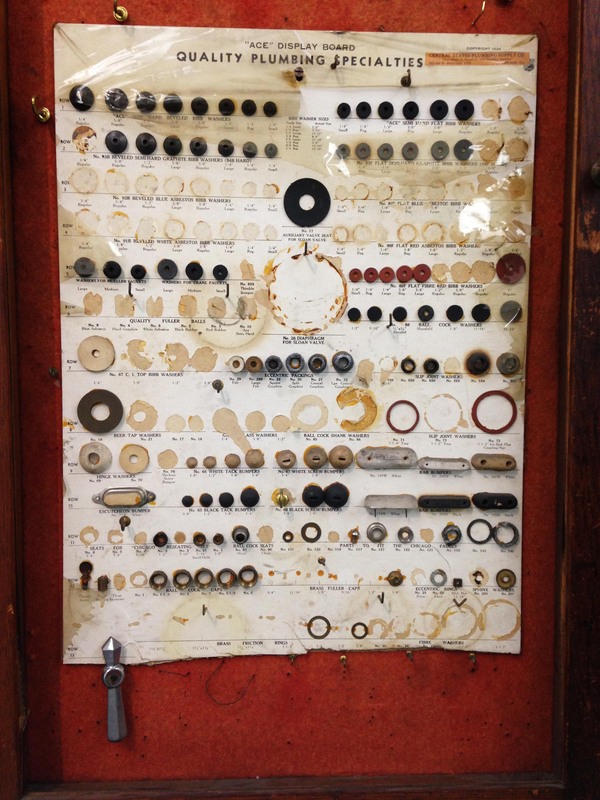 Another room featured pieces created from fragments of a hardware store in Chicago that recently closed. 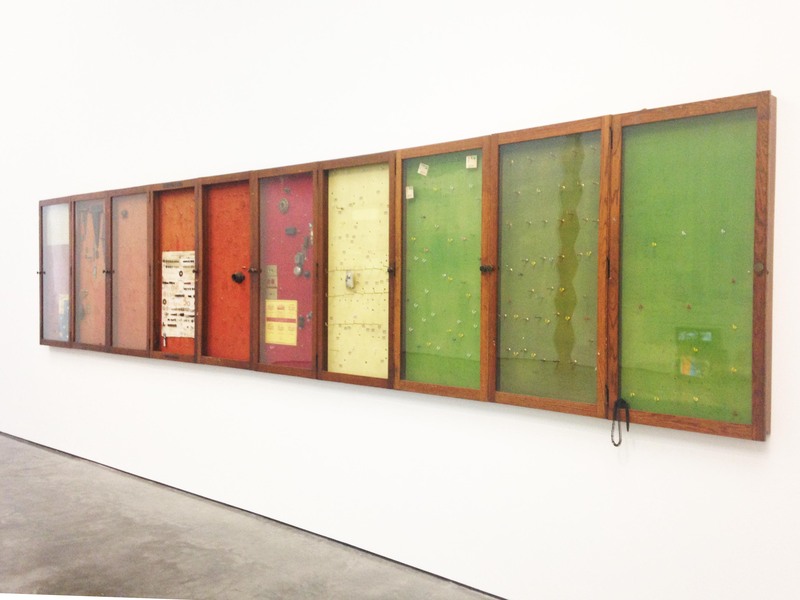 One exhibit was a row of felt-backed cabinets, reclaimed from the shop, another was a tower made of perforated hardboard that had formed the back of the shop wall. Another room held flooring from an old gymnasium: once hung on the wall the beauty of the work in the simple varnished floorboards, worn by decades of use, is visible. Gates recently used his reputation as an artist to the advantage of Chicago’s Stony Island Bank that he has been campaigning to save. 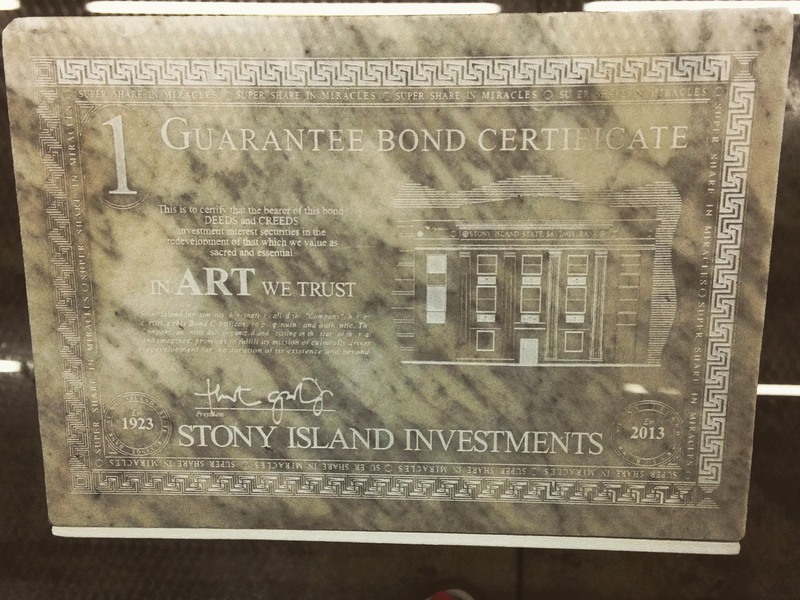 Gates played the art market and sold 100 ‘Art bonds’ for $5,000 each, engraved on to pieces of marble reclaimed from the bank’s urinals. On these tablets is engraved: “In Art We Trust”. They are signed by Gates who ploughed all the money back from the sales into the building that has been saved and will reopen as a community and arts centre. Gates’s solutions for specific localities using art, seem to hold answers for the post industrial age in which many large cities in the west have stopped manufacturing and there is no clear answer for revitalising buildings or areas that have lost their original use. The success of Gates’s projects in Chicago gives hope to communities all over the UK where SAVE is involved, including Granby in Liverpool where the Community Land Trust has kept their semi-abandoned street lively for many years using abundant street planting, and holding a monthly market. Now they have been given ownership of the street and thanks to hard work from all involved, it is being restored. Assemble Architects, invited to the area by Steinbeck Studios, designed a new vision for the site, that was this year nominated for the Turner Prize. This would probably not have happened without Gates’s pioneering work that combines art, urban planning and community. Ground Rules (Scrimmage) from the Freedom of Assembly exhibition – assembled from pieces of flooring from a former gymnasium floor. Previous Previous post: Crossbones Memorial Garden, Bankside – a community-led transformation.